I can remember Mom making cream puffs when I was a kid. They seemed like the most perfectly fanciful dessert to ever come out of the oven, all magically puffed up and golden and hollowed out in the center, ready to be filled with a big spoonful of freshly whipped and sweetened cream. It was such a treat for me to revisit making cream puffs again. 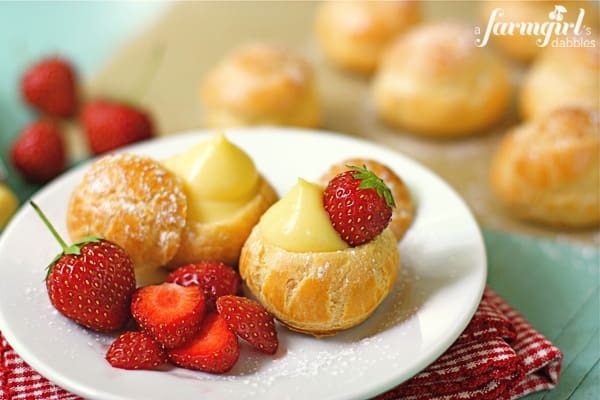 These Mini Cream Puffs with Vanilla Pastry Cream knocked the socks off my family. We’ll definitely be making them again! 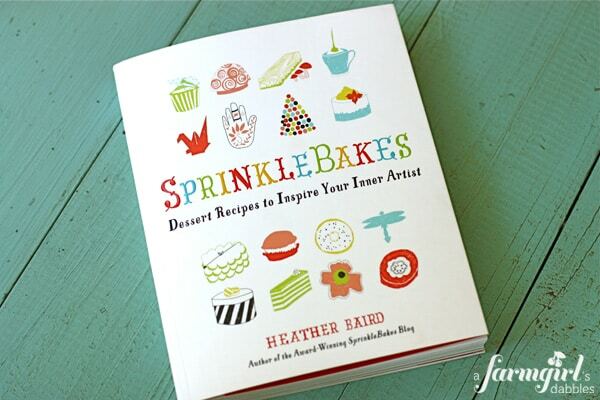 Do you know Heather Baird, the author of SprinkleBakes blog? If you do, you’re already aware of the magic she concocts in her kitchen. A true artist at the core, she never ceases to amaze me with her baked creations. Of course I had to get my hands on her recently published cookbook! Heather’s book is whimsical and extremely colorful, and manages to stretch your mind beyond the typical baking cookbook. For a peek at the incredible baked art within those pages, check out Bridget’s post, where she highlighted several “wow” recipes on her own blog, Bake at 350. The SprinkleBakes book has been widely touted for its imagination and adventure in the kitchen, with great instructions and photos to guide everyone confidently through each recipe. But I also want you to know that it’s a book that gives you freedom to be beautifully simple, too. Filled with a thick and silky vanilla pastry cream (I literally licked the bowl clean! ), it is a classic dessert that never fails to deliver sweet enjoyment. 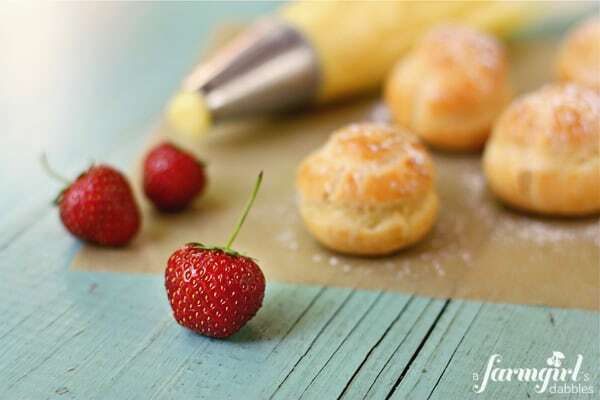 With a few fresh strawberries from our morning at the local u-pick, our little cream puffs were pure summer heaven. Aren’t they just so cute?! I wish you could taste your screen! Here’s the recipe. 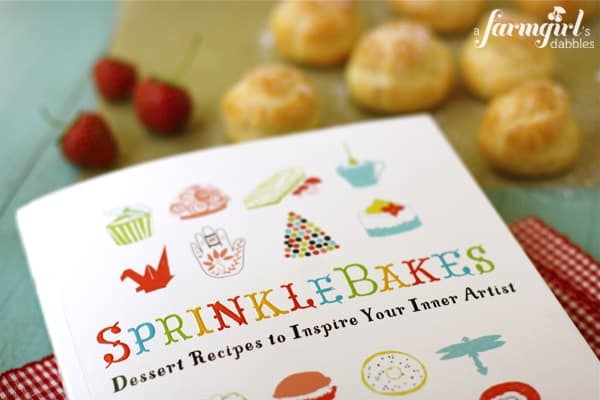 And if you’d like your very own copy of SprinkleBakes (yes, you do! ), just scroll down for a chance to win! Line 2 baking sheets with parchment paper. Fit a pastry bag with a large plain round tip, or snip 1/2” off the tip of a filled disposable pastry bag. In a medium saucepan, combine the water, butter, sugar, and salt and set over medium heat. Bring to a boil, stirring occasionally. When the mixture reaches a boil, remove from the heat and sift in the flour. Stir to combine. Return saucepan to the heat and cook while stirring constantly until the dough begins to pull away from the sides of the saucepan. Transfer dough to a bowl and stir for 1 to 2 minutes to cool it slightly. Add 1 of the eggs to the dough in the bowl. As you mix, the dough will break into pieces and appear loose and shiny. As the egg becomes incorporated, the dough will become coarse looking, like mashed potatoes. When this happens, add another egg and repeat the process until you have incorporated all the eggs. Transfer the dough to the pastry bag. Pipe the dough into mounds that are about 1-1/2” to 2” in diameter, and about 1” high. Space the mounds 1-1/2” apart on the lined baking sheets. Using a clean finger dipped in water, gently press down on any peaks that formed during piping. The cream puffs should have rounded tops. 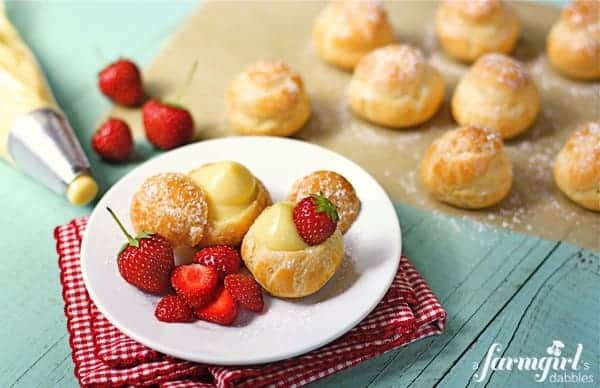 Brush the tops with the egg wash. Bake for 10 to 12 minutes, or until the cream puffs are well inflated and beautifully golden. Be sure to keep the oven door closed until the cream puffs are golden brown. Opening the door before they are golden may cause them to deflate. Now lower the oven temperature to 350° and continue to bake the cream puffs until they are dry, about 18 to 20 minutes more. Transfer the cream puffs to a wire rack to cool. In a small bowl, dissolve the cornstarch in 1/4 cup of the milk. Beat the whole egg, then the yolks, one at a time, into the cornstarch mixture. In a saucepan, combine the remaining 3/4 cup milk and the sugar and bring to a boil, whisking constantly. While whisking the egg mixture, slowly pour 1/3 of the boiling milk into it, to temper the eggs. Return the remaining milk in the saucepan to medium heat. Pour the hot egg mixture into the saucepan in a thin stream, whisking, to not let the eggs scramble. Whisk constantly until the mixture begins to boil. Remove from the heat and whisk in the butter and vanilla. Pour the pastry cream into a bowl and press a sheet of plastic wrap directly on the surface so it does not form a skin. Cool to room temperature. Refrigerate until ready to use. This can be done a couple of different ways. To fill like I did, simply cut off the top 1/3 of the cream puff with a serrated knife. Fill a pastry bag fitted with a large round tip with the vanilla pastry cream and pipe some into the bottom portion of the cream puff. Alternatively, you could just use a spoon to fill the cream puff. 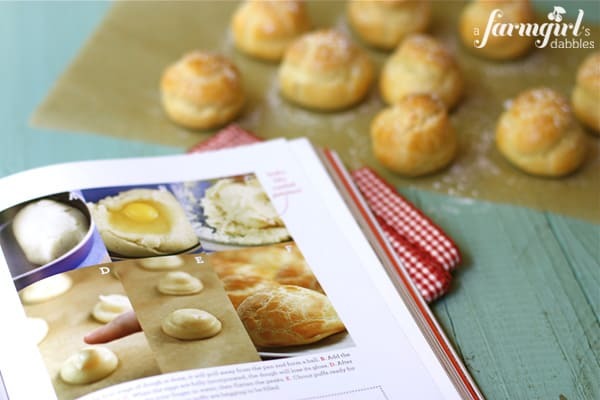 Or…to fill the cream puffs like Heather does in her book, pierce the side of each cream puff with a knife, making a small incision just big enough to fit a pastry tip inside. Pipe in the vanilla pastry cream and press gently to close incision. Sprinkle with powdered sugar and serve with fresh berries. Adapted slightly from SprinkleBakes by Heather Baird. To enter the giveaway for a copy of SprinkleBakes, please use the widget below to sign in. The first way to enter is to answer a question. Don’t be concerned if you don’t see your reply in the blog comment section below – comments for the giveaway will NOT appear below. 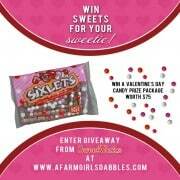 But, rest assured, you WILL be entered in the giveaway! If you would like to leave a comment without entering the giveaway, please leave a comment in the usual way. Thank you!! Find SprinkleBakes at Heather’s blog, on twitter and facebook! This giveaway is open to US residents and ends at 12:01 am EST on July 4th. Winner will be notified by email and will have 48 hours to respond and claim their prize, or another winner will be chosen. Disclosure: I received a copy of SprinkleBakes for myself to review. All text and opinions are 100% my own. How far ahead can you make the puffs before filling? These are beautiful! I love when desserts are both beautiful and delicious! these are the cuttest little things, ever! scary, seems pretty easy to just pop these right into your mouth, one right after the other! I love cream puffs. 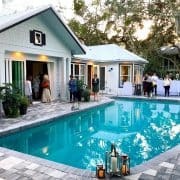 Great pictures and great giveaway. I love her Heather’s blog and her book, so don’t pick me for the giveaway. I already own it. I just wanted to let you know how good these look and that the book is great! Thanks bunches, Naomi. Happy 4th to you & your family! Oh how I love cream puffs. Your pictures as always do make me want to eat the screen! lovelylovely! I love them, but I never made them before. Your cream puffs look perfect! I grew up with my mom and grandma making cream puffs for dessert too, and they remain one of my favorites! Just adorable little cream puffs! Look wonderful with that vanilla pastry cream filling and strawberries. Oh man, these are absolute perfection! I’m a bit intimidated by cream puffs but you’re definitely inspiring me to give it a try! Don’t be intimidated! The instructions are great. And if you don’t want to use a piping bag & tip, you can just use a couple of spoons to place a portion onto the baking sheet. That’s how Mom used to make them…I believe from a Betty Crocker recipe. Your recreation of Heather’s recipe looks great! I love her blog as well – her treats are always so creative and look delicious. My family would LOVE these puffs! Anything creamy and sweet gets snapped up in about 2 seconds in my house! it would be fabulous to win the cookbook to make these delightful treats!! Thanks!!! These are beautiful! I love anything lemon! Thanks for sharing. OMG, these are just too adorable! 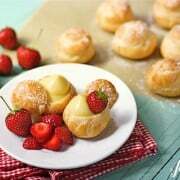 I super love cream puffs! And in mini form? TOO CUTE! Thank you, Lynna. The minis are absolutely irresistible! Not sure if I’ll make big ones ever again! These are on my list to make!! yours look gorgeous Brenda! These are beautiful! 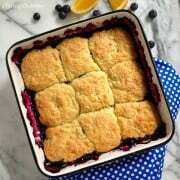 Love this recipe and I loooove that book! Those candy bowls are so pretty! These turned out fantastic! I need to make another batch soon. They were SO good.